mikeselectricstuff and 1 Guest are viewing this topic. Working distance in this configuration was crazy small and unusable, like an inch or two. Measured what I have in my setup. So bench to scope is 5". I can turn a ~5" board near vertical and the AF with the mag @ min, it will focus on anything from the bench to about ~3.5" above without ever changing the microscope focus. That alone is a hell of an upgrade from what I had. It goes to hell when your working on the edges of what the AF can deal with. If I have the eye pieces in focus, the cam seems in its happy spot. At least if I move the scope within ~50% of its mag range. Moving from min to max, I need to adjust the cam height in the adapters so its happy again or deal with endless hunting. I never really use my setup at the max. Pi to fake the mouse should certainly work I would think. Find if I'm mindful of the AF, just keep the window in areas of the same height its not too annoying. A foot pedal would be ideal. Cam pics with board ~vertical. This board with tons of crap on the ends, isn't the best case by any means. I've finally had the time to probe around J50. It is indeed a serial port, running at 3.3V and a baudrate of 115200. The serial port leads into a ROOT linux console. No password needed. I'll try to dump the files by using a flash drive. Stay tuned. I've also attached the pinout of the connector. Spi(cs1): Block:64KB Chip:32MB Name:"MX25L 256/257 35 E/F"
Found Nand Flash Controller V610. hisi_i2c hisi_i2c.0: Hisilicon [i2c-0] probed! hisi_i2c hisi_i2c.1: Hisilicon [i2c-1] probed! hisi_i2c hisi_i2c.2: Hisilicon [i2c-2] probed! hi3516a_base: module license 'Proprietary' taints kernel. Since that boot lists the SoC, here's the short form datasheet. Hisilicon released Hi3516A SoC (System on Chip) which is based on latest H.265/HEVC standard for high definition IP cameras. The Hi3516A adopted Hisilicon H.265/HEVC algorithm, greatly improved image quality to eliminate motion blur, meanwhile reduced 50% bit-rate without compromising the image quality. Furthermore, Hi3516A utilizes ARM Cortex-A architect, integrated with Hisilicon's 2nd generation intelligent video analysis unit (IVE2.0) to support license plate recognition, perimeter protection, facial recognition, zone alarm...etc more than 40 different kinds of smart video analysis applications. Through multi-frame combination WDR and Hisilicon's third generation 3D noise reduction technology, although security cameras work in challenge-able lighting condition, it can still provide excellent images. Hi3516A support up to 5 megapixel real time video encoding, utilizing Hisilicon's advanced network transmission technology, the video latency can be achieved below 100ms. Just like my AVio capture device doesn't detect it. I've had some success connecting an Arduino Pro Micro to the USB port and using it to programmatically turn autofocus on and off by emulating mouse movements and clicks. Eventually I'll try to rig up something nice with some buttons, LEDs, and a jack for a foot switch. A 3-pack of Arduino Pro Micro clones from Amazon was only about twenty bucks. Although it would be nicer to exploit the serial header that's been discovered, if that turns out to be impractical, this seems like a useful technique to fall back to. I received the microscope adapters (https://www.aliexpress.com/item/Low-Price-0-5X-C-mount-Lens-Adapter-1-2-CTV-Adapter-For-SZMTV1-2-Trinocular/32814332968.html) that I ordered to hook this up to my trinocular. * Autofocus suffers from significant vignetting as one zooms in. I spoke too soon! I just played around with it fiddling with the adjustment ring on the adapter. I can get it parfocal with the eyepiece, and I can get the working distance equal to that of the eyepiece! I still don't get much usable zoom out of the Amscope though. What microscope head are you using? Once I get this cam where I want, I'm upgrading to a real trinok head where all ports have light. With Amscope, the closest match to what I have now is the SM745TP which still has the same 23mm photo port interface, you must have some threaded port. The capture problem I have to assume isn't a big hurdle. It works fine with HDMI monitors I tossed at it, so there must be a capture device that's compatible. The only reference I have is "3.5X-45X Trinocular Stereo Zoom Microscope on Single Arm Boom SM-3TX 1 379.00". Typical of Amscope, it's not all that easy to figure out exactly what I have. From what I gathered on Aliexpress, there were two styles of adapters for two different generations of Amscopes. There's the "old" threaded style like mine, and there's a newer bayonet style. I also have a 0.5X barlow attached to the Amscope, screwed into the very bottom. A real trinocular head that was live to all three ports all the time would be nice. 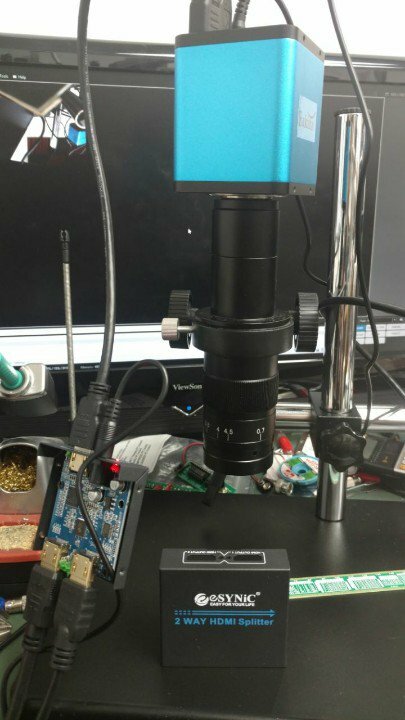 I'm looking to get one of those cameras for my AmScope trinocular microscope, but I have a question: can it output a square 1:1 image using the whole sensor? - my current camera outputs 16:9 and crops the top and bottom. And here's a handy thing for getting the camera's view similar to that you see through the eye pieces: Focus adjustable 0.35X C mount adapter for New Type of Amscope, the one with the flange rather than screw mount. https://www.aliexpress.com/item/0-35X-focus-adjustable-C-mount-adapter-for-New-type-of-Amscope-s-Trinocular-Stereo-microscope/32830788378.html For my camera I needed to add a 5mm C-mount extension tube to get the focal distance down to normal. There is a little bit of barrel distortion, but its still much better than the slide tube that comes with the microscope. I first saw it being used by Paul Daniels (not the magician) on his iPhone repair YouTube channel. On the subject of camera lenses - that is a lens between the camera and the third port. The image you see depends on the sensor size in the camera. A small sensor (around half inch) crops and magnifies the image - so you need a reduction lens, like above. But with an APS-C or Full Frame sensor you need a magnification lens as otherwise you get to see the barrel of the connecting tube. So what is the soldering experience like under one of these compared to a typical stereo microscope like an amscope? My eyes being what they are, I need bright lights and magnification even to do through-hole soldering these days. As such when I work on a project, I sit hunched over the amscope for a bit and it becomes tedious. The Camera+monitor approach I assume would lessen the need to hunch over. Is a small screen closer to the eyes better, or is a large screen further away better? Does the autofocus try to refocus as one moves the soldering iron about? I'd be interested in hearing about how useful this is for soldering too. I'm getting to the point where I'm in the same boat and am in need for a magnifying aid. How's the display lag, and is there an issue with autofocus jumping around when moving an iron (or worse, braid) under the scope? Anyone know how the 120x stacks up against the 180x? Also, I went poking around the Eakins Aliexpress store and it appears they have 4 variants of the camera using the IMX290 sensor. In addition to the one Dave reviewed, there's a near identical version without the microsd card slot, and then there's this thing. It also comes with or without the microsd card slot, and appears to have the optics built in. But what's interesting is the version with microsd has an I/O connector. They also have two different stand versions. One with a boom and one without. That's a lot of options there. How's the display lag, and is there an issue with autofocus jumping around when moving an iron (or worse, braid) under the scope? Hard to see any lag to the display. AF and soldering would be a PITA without a foot pedal to lock it IMO. Personally I don't know I could go from stereo vision to a display without a load of practice and really wanting to. That said, I don't solder 8hrs a day. The lens and its 0.4x brother are crap quality, focus is off on just one side and there seems to be bubbles in the glass that the AF will sometime focus on. That said 0.3x seems to give me an acceptable magnification range would like even less. Things are parafocal with the eyepieces. Getting closer... Will have to try Kazzle's suggestion. All I soldered was a couple of 0.100" headers. There are two things that struck me: 1) lack of depth perception makes soldering a little more difficult, and 2) the natural human inclination is to look toward what you're working on rather than looking at a screen on the wall. I think with practice you could adapt to both of these differences. I highly recommend getting one of the barlow lenses for it to reduce the magnification and increase the working distance / field of view. My gut feeling is that my preferred tool for soldering is going to remain my Amscope microscope, and my tool for inspection will shift toward the Eakins (mounted on the Amscope's trinocular photo port). I have a solution for AF/MF toggle (including a foot pedal). Going to do up a video on that this weekend. Has anyone measured the latency, e.g. by pointing the cam at the monitor? You would have to have a capture device device right? I jumped on the Eakins bandwagon a few weeks ago. After getting the run around for 2 weeks then it 'accidentally' getting shipped SF Express instead of DHL adding another 2 weeks, I finally received my very own copy. I went with just the head w/180x lens, the 300x lens, a ring light, and the set of 3 Barlow lenses (.35, .5, 2x). My bench shelves are made out of 8020 extrusions so I used that to make up a quick overarm to hold the camera. It keeps the bench clear and allows me to raise the scope over 1m off the bench . In addition, I 3D printed an adapter to stack the .5x lens on the bottom of the .35x Barlow. With that combination and my camera at the ceiling I can get a 130mm (5") FOV, although zoom is limited by the distance between the 2 stacked lenses. For my needs, the 180x lens with the .35x Barlow provide an adequate range for routine PCB stuff. The UI is just painful to use. The mouse is way too sensitive and I had an extremely difficult time keeping it on the focus scroll bar while using the scroll wheel. I had the same idea as smbaker to use Pro Micro's due to their small size and ability to act a mouse. I used a rotary encoder for changing values in the scroll bars, a BCD coded switch to select the various functions, 3 pb switches to act a soft keys, and of course the ubiquitous 16x2 LCD for the display. I had a difficult time getting things to work at first. I finally figured out that the camera is very slow and was simply missing events if I sent them at full speed. Every mouse move or click event has a delay between it and the next event. It still misses things now and then and gets out of sync, but selecting something else usually gets it in line. I have the majority of the items on the camera menu implemented and most of it works well despite the clunky way I'm going about it. I'm waiting on some prototyping PCBs to show up so I can get it off the breadboard and into a case. I had the same idea as smbaker to use Pro Micro's due to their small size and ability to act a mouse. I think I have a Digispark AtTiny85 lying about in a junk box somewhere. It is likely the only pre-built MCU module I have that supports USB directly. I think it only has 4 I/O when USB is in use, so I will have to settle for AutoManual, FocusNow, Picture and an LED. Looks like it might support emulating a mouse. I finished building and trying out mine today. I too had to play with delays a bit to make the whole thing reliable, but at this point it seems to be pretty solid. I'm intrigued - did you ever dump the flash? I connected to the serial console, and managed to copy what appears to be the main program, and a couple other files also in the /opt/ directory. If anyone knows a good method to dump the entire flash, I will gladly do so and post any findings here. I'm working on setting up a USB->ethernet dongle, so I can connect with SSH. Can anyone find a full datasheet for the Hi3516A processor? It looks like there's ethernet onboard. Thanks so much this project idea. This was so awesome, it's on my short list to apply to my microscope as well. Quick question for other owners of the Eakins microscope. Is anyone using the supplied small LCD monitor that came with the kit? If so, do you have any pictures for how you've mounted it to the stand? I can't for the life of me work out how it mounts on the black horizontal bar with holes in it. The monitor comes with a a massive sticker and wall mount to attach it to a flat vertical surface. How is it supposed to connect to the supplied stand? I'm using the monitor and stand. I'm not using the sticker or wall mount bracket at all. I'll try to remember to take pictures tomorrow. I think we're getting closer to finding the OEM. Awesome! The closest I've got to getting it attached it rotating the whole so they are vertical and using the too long bolt to thread into the bottom of the monitor. But seems flimsy as all get out.